This Alcatraz crossing is great for swimmers that have crossed many times from Alcatraz to San Francisco, or for the experienced open water swimmer wanting to race Alcatraz in style for the first time! The St. Francis route, despite being 1.8-2.1mi, is faster than Aquatic Park due to sweeping currents in your favor, giving all swimmers a speedy boost. This swim is a favorite among the fastest Alcatraz veterans, as well as the first timer who wants to test their swimming endurance in a competitive setting. Medals will be given to all participants with trophies for top racers. Be in it to win it! This information is subject to change. Registered swimmers will receive an email 1-2 weeks prior to race day confirming conditions, temperatures, times, locations, parking options, etc. Passenger space, if available, will be made available for registration and announced in that email as well. Join us for this round trip Alcatraz swim! 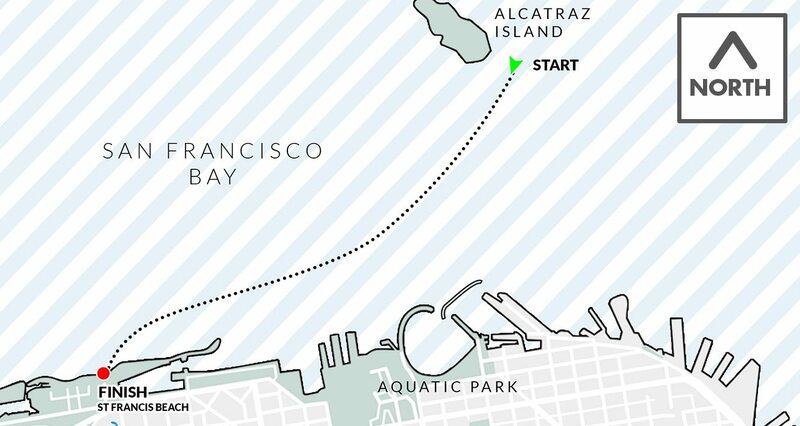 This swim is a great challenge for fast swimmers that requires a strategic race plan to swim the 3.6 mile course with tides and fast currents around Alcatraz. This is also an excellent event to help prepare for longer open water endurance competitions. Some of the best open water swimmers at the national level compete in Swim Around The Rock. This swim starts off the beach of St. Francis, and you'll swim along a fast and exciting current. But as you make your way clockwise around Alcatraz, that's where the real challenge begins - you'll have to navigate not only around the prison, but through the currents as you make your way to Aquatic Park. A challenge you won't forget for sure! This event is for experienced open water swimmers only. This swim will not only require swimming strength and open water experience, but expert ability in navigating a winning course with complex currents. This is easily our most difficult bay race, even more so than Bridge to Bridge 10K. If you need advice, support, and coaching for this swim, Water World Swim can help. 0 swimmers will start the race at the South Tower and finish at Fingerpoint Rock. A thrilling world class swim at a historic landmark for experienced swimmers!